This week we roast the first of Ranui Garden garlic in the same casserole as the beets we also find in our CSA box. The garlic roasts into buttery goo and at the same time subtly infuses the beets with garlic essence. This recipe for roasted golden beets and their greens with garlic orange dressing features both the beets and their greens in one delicious dish. Mellow roasted garlic orange vinaigrette seasons both the bed of warm sautéed beet greens underneath and the sliced roasted beets nestled on top. Sweet roasted beets juxtaposed with their barely bitter greens and tangy salty feta cheese, all in the same bite–sweet, sour, salty and bitter–yum! Make this recipe as soon as you get the beets, because beet greens deteriorate more quickly than other greens. The cheapatarian in me hates to see them go to waste. Some of the roasted garlic goes in the garlic orange dressing–the extra cloves are great spread on crackers or crostini. 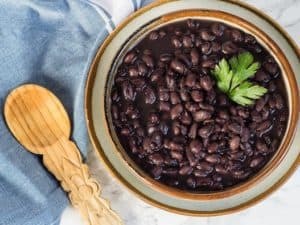 If you like healthier desserts and interesting vegetarian recipes, please sign up to receive notices when I post a new recipe. The green Subscribe box is on the upper right on desk and laptop computers. On mobile devices, scroll to the bottom. Two vegetables in one--beets and their greens. Wilted beet greens become the bed for roasted beets--all are dressed with a delicious roasted garlic and orange dressing. Preheat oven to 350 degrees. 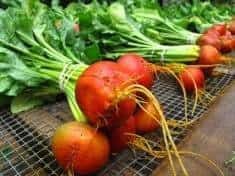 Trim the beet tops, leaving a 1-inch tail, reserving the top greens. 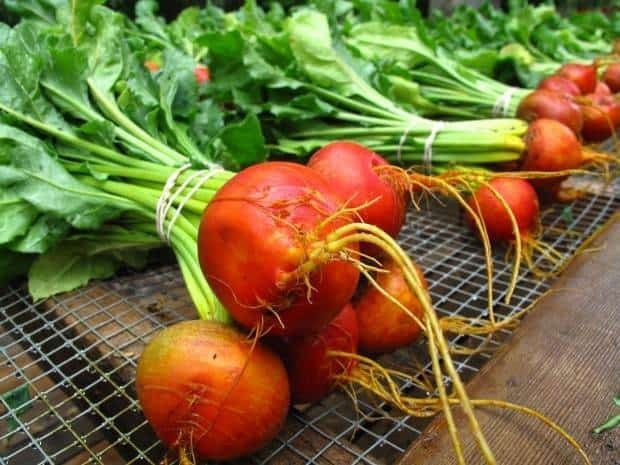 Scrub the beets. Break the garlic up into individual cloves, but don’t peel them. Put the beets and the garlic cloves in a small casserole, add about ½ cup of water and cover with a lid or foil. Bake until a knife slips easily into the largest beet, about 1 hour; the time will vary depending on the size of the beets. Meanwhile tear the beet greens off their stems, discarding any yellowed or wilted greens. Cut them into 1-inch ribbons. Set aside. When the beets are tender, let them cool enough so you can slip off the skins. Trim the tips and tails and cut the beets in wedges or slices. Squeeze about half the cloves of cooked garlic into a bowl and mash it well with a fork. Add the first 3 tablespoons of olive oil, the balsamic vinegar, orange juice, minced onion, salt and cayenne, and whisk together well. Toss the beets with half of this dressing. Heat the remaining olive oil in a skillet. Add the beet green ribbons. Cook and stir until the greens are wilted and tender. Toss in the remaining dressing. Season to taste with salt and pepper. Transfer the greens to a serving plate. Arrange the dressed beets over the greens. If desired, sprinkle with crumbled feta cheese, . Just a quick one today. We found a bunch of leafy green tender bok choi in our CSA box today, which is inspiration for this recipe and one easy last minute dinner–Bok Choi and Carrot Stir-Fry with Toasted Cashews. Most cookbooks spell it Bok Choy, but the seed packet from which Farmer John sowed must say Bok Choi. That’s how he spells it. Bok Choi (or bok choy) is Chinese cabbage with crisp white stems and slightly bitter tender greens. 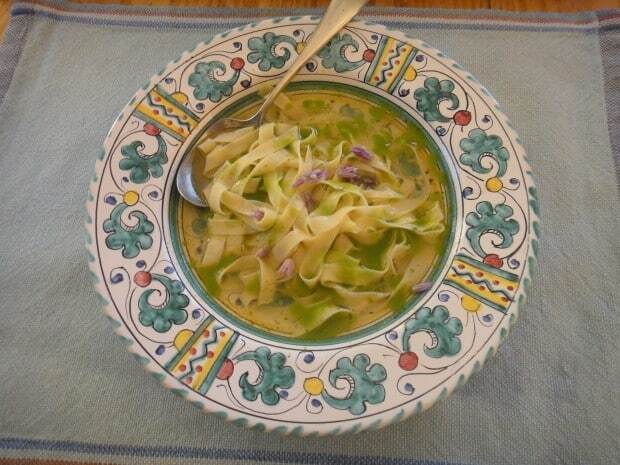 This is a variation of a recipe in Vegetarian Cooking for Everyone, by Deborah Madison. She adds roasted peanuts to her bok choy stir-fry. Serve on a bed of soba noodles, rice or wheat-free rice noodles. Wishing you a fabulous week–get in the kitchen and cook something delicious! Thanks for reading. Get the latest recipe posts by email—subscribe here. Serve this delicious stir-fry with brown rice or soba noodles. Heat the first 2 teaspoons of oil in a skillet. Add the cashews and stir and cook until they are light golden. Add the pepper flakes and salt. Set aside. 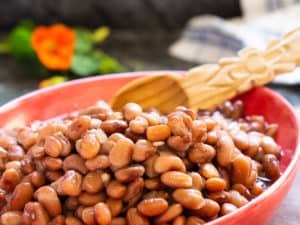 In a small bowl, mix the arrowroot with 3 tablespoons of water to make a slurry; set aside. 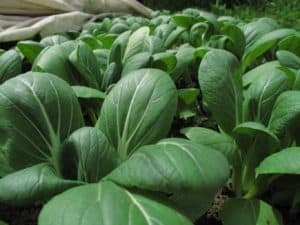 Trim the leaves off the bok choi stems. If they are small, leave them whole, if larger, cut into 3-inch ribbons. Cut the stems into 1-inch lengths. Heat the remaining oil in a skillet or wok over high heat. When hot, stir in the garlic and ginger and stir-fry about 30 seconds. Add the carrots and stir-fry several minutes, until the carrots are almost tender. Then add both bok choi stems and leaves and stir-fry until the leaves are wilted. Add the soy sauce and the arrowroot slurry and stir-fry until the vegetables are glazed. Season with more pepper flakes if your heat quotient runs on the hot side. 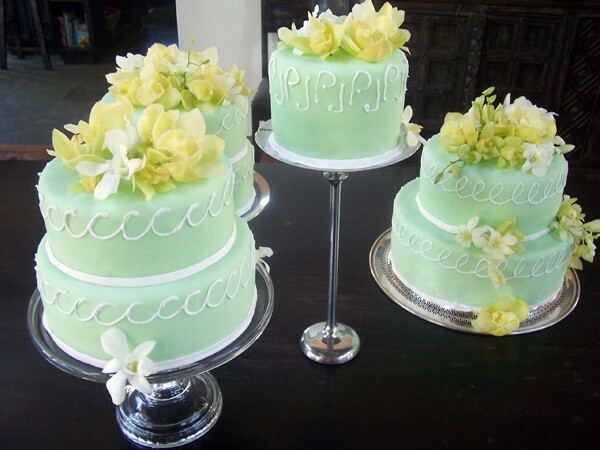 For the big day, I gave my niece and her husband their wedding cake, seven layers, and two different flavors. This post is about the process of baking and transporting their cake, with recipes converted down for home cooks. Here’s everything you need to make smaller versions of Tricia’s lemon raspberry cake and chocolate truffle cake, the cakes, the fillings and the frosting! Stashing containers summer’s pesto is the most squirrel-like getting-ready-for-winter thing I do. When fresh basil is garden plentiful, I pull out the food processor and whip up a batch. This pesto freezes beautifully, so that’s where I keep it. All winter long, when I want pesto for pasta or pizza, there’s a ready stash of easy basil walnut pesto! Using a food processor, this pesto is quick to make–the work is in stripping the basil leaves off the stems. The garlic is super-easy to mince–begin your pesto by dropping whole garlic cloves in the work bowl while the processor is running and the blade is spinning. When the garlic stops hitting the sides of the processor bowl, it’s perfecty minced! Compared to many other pesto recipes, this easy basil walnut pesto has less olive oil–more basil bang for the buck. Not that extra virgin olive oil is a bad thing! You will love the flavor and budget-wise variation with walnuts and Pecorino Romano cheese in place of the more expensive pine nuts and Parmesan cheese called for in classic Italian Genovese pesto. 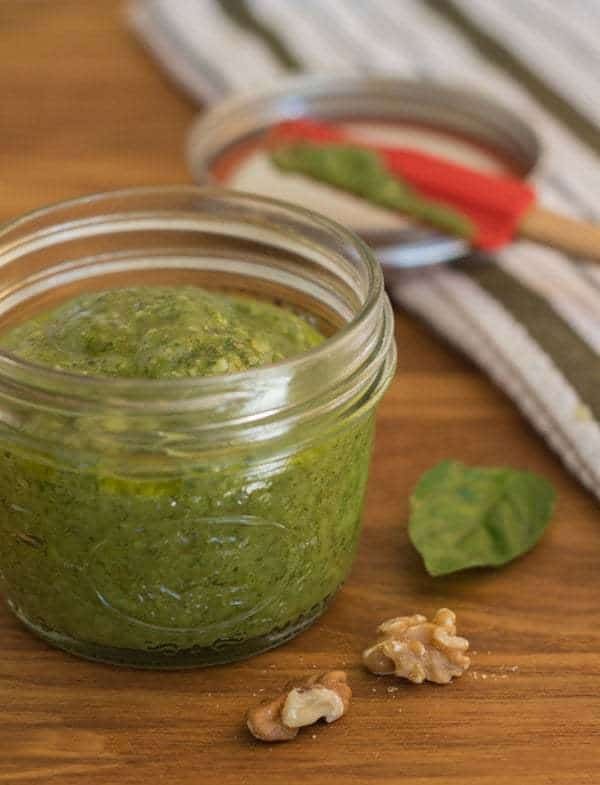 Click here to PIN Easy Basil Walnut Pesto recipe!